Video Recipe - My favorite recipe for leg of lamb. The best taste and fairly quick preparation. What's not to love about it? The marinade and grilling results in a very good and strong flavor. The trick is that a the leg gets more surface when the bone is removed. And the surface is of course where most of the flavor is. 1-2 dl (½-1 cup) oil, not so important what kind. Blend together the ingredients for the marinade. 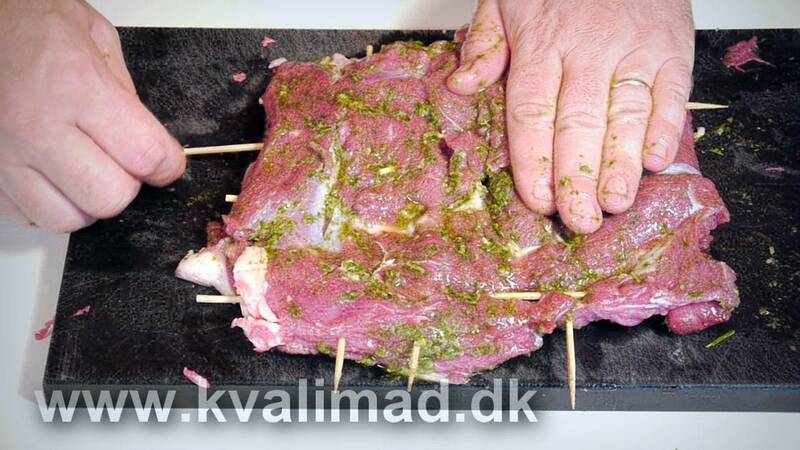 Plug skewers through the meat on the thin edge, so it does not clump together or curl during grilling. Rub the marinade onto the meat, then let it rest an hour before grilling. Put it over a direct heat on the hot grill. No slow grilliing with a charcoal holder on the side! Grill it for a total of about 10-15 minutes until the meat is firm, but nor hard, to the touch. Turn it over as few times as possible. That makes the best crust. But make sure it does not burn. 5 minutes on each side is ideal. On my grill! Under the lid. 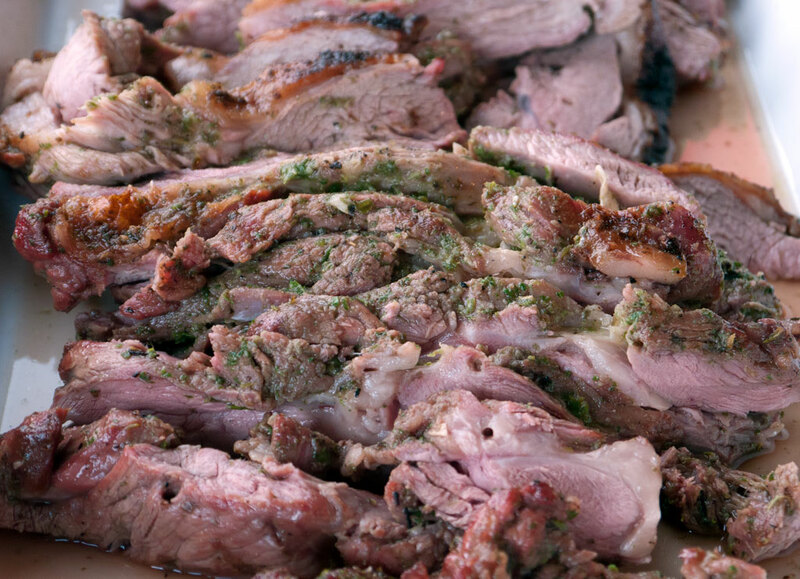 If you have a large leg of lamb you must double the amount of marinade. If you don't want to bone the leg of lamb yourself, let the butcher do it for you. Lamb Clubs can vary a lot in weight, so it is difficult to specify just the right amount of marinade. 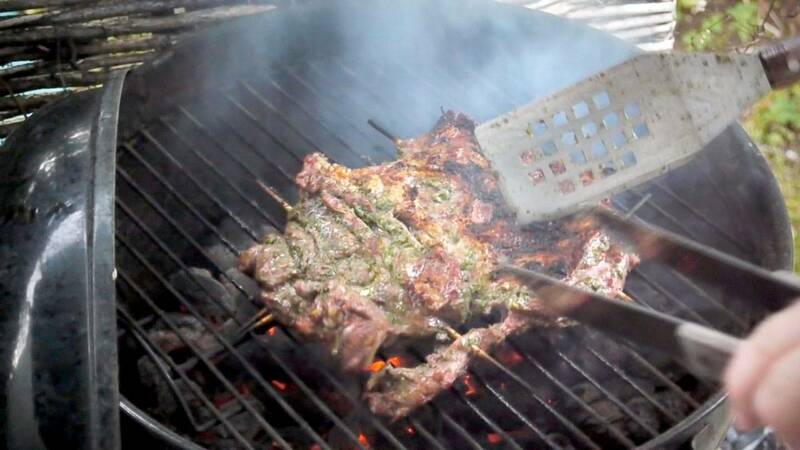 There should be enough marinade that it can cover the entire leg of lamb completely, and the marinade should be like a thin porridge before adding, so use as little oil as possible. You can easily use other herbs such as thyme and allspice. So if those are your favorites, just use those. Put a little wood chips for smoking, or rosemary sprigs, onto the coals to promote the smokey flavor. You can also put the meat into a 250°C (480°F) oven for 10-15 minutes. If you are unsure whether it has had enough, then cut a small incision in the thickest part of the meat. It should be pink but not raw. I enjoy your videos and the soothing voice with music. stop slacking and make more!